:Train ?Em Up is an interactive, fun-filled, and affordable series that uses a train locomotive theme for teaching kids core Christian beliefs and principles. In Tell Me about Praise and Worship, a friendly train conductor, Mr. Steve, teaches the joys of praise and worship and why it is so pleasing to God. Through bold graphics and interactive songs and stories, Train ?Em Up makes it easy for parents and teachers to explain biblical concepts like praise and worship in a way that helps with attention, memorization, and recall while building a solid faith foundation. Each book in the series includes a CD with sing-along songs and narrated stories with sound effects, plus a colorful sticker sheet! 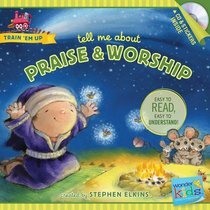 About "Tell Me About Praise and Worship (Includes CD & Stickers) (Wonder Kids: Train 'Em Up Series)"
Stephen Elkins, a Grammy-nominated record producer, the president of Wonder Workshop, and author of the acclaimed Word and Song Bible and LullaBible, lives with his family in Nashville, Tennessee.